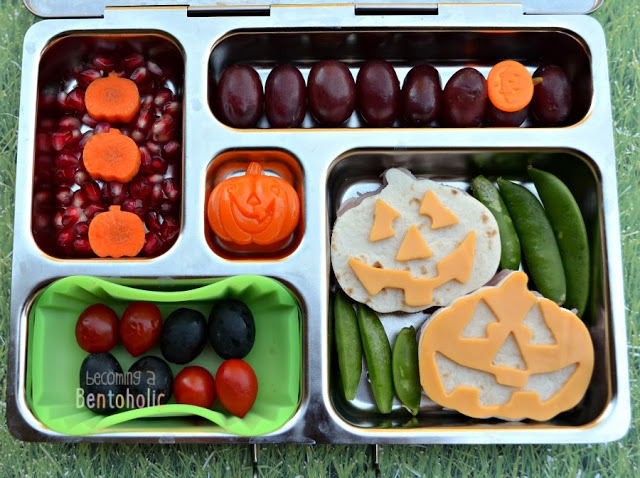 Year 2, Week 12: Halloween Pumpkin Patch Lunch. This weekend my family and I visited a local pumpkin patch. It was a ton of fun and my kids picked out a funny looking pumpkin to carve. It was the first time they got to say what design was carved into the pumpkin. It was one of those moments where the perfectionist side of me cringed and I had to let go. That's what you have to do as a parent sometimes, isn't it? It's hard, but it helps our kids have much more fun, even if its not how we pictured the project looking in our heads. This trip to the pumpkin patch helped inspire this week's lunch. 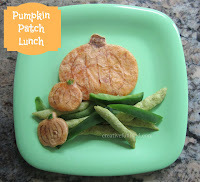 They have pumpkins of all shapes, sizes, and colors so I tried to make a lunch that reflected that. 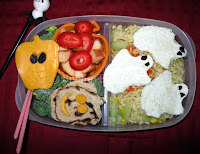 This is an easy Halloween lunch because I used a few pre-made things that had a pumpkin theme. I even threw in a little treat for her. After all, it is Halloween! 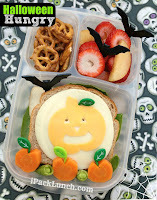 This was made in an Easy Lunch Boxes container and I included a Halloween Lunchbox Love note. 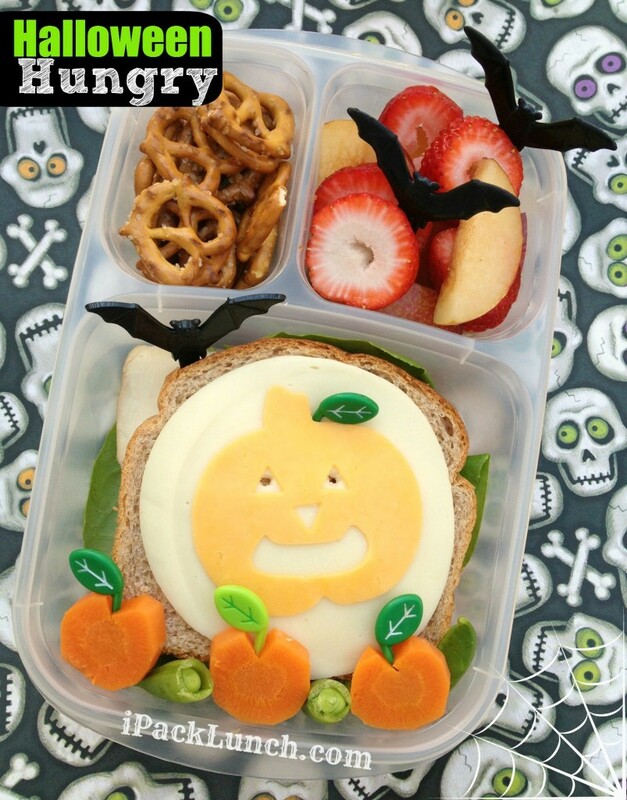 At the bottom of the recipe there is also a list of some other great pumpkin patch lunches from talented bloggers. You will never run out of ideas for this theme! 1. Mix pretzels and pumpkin seeds and place in a side dish. You can roast your own seeds or buy them in store. 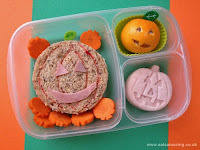 We like making our own when we carve a pumpkin, it is easy and fun! 2. 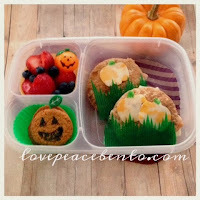 In a second side dish place the marshmallow, cookie, or whatever other treat you wish to have in there. 3. Take the slices of cheddar cheese and fit them, as the background, into your main container. You might need to cut them to fit. 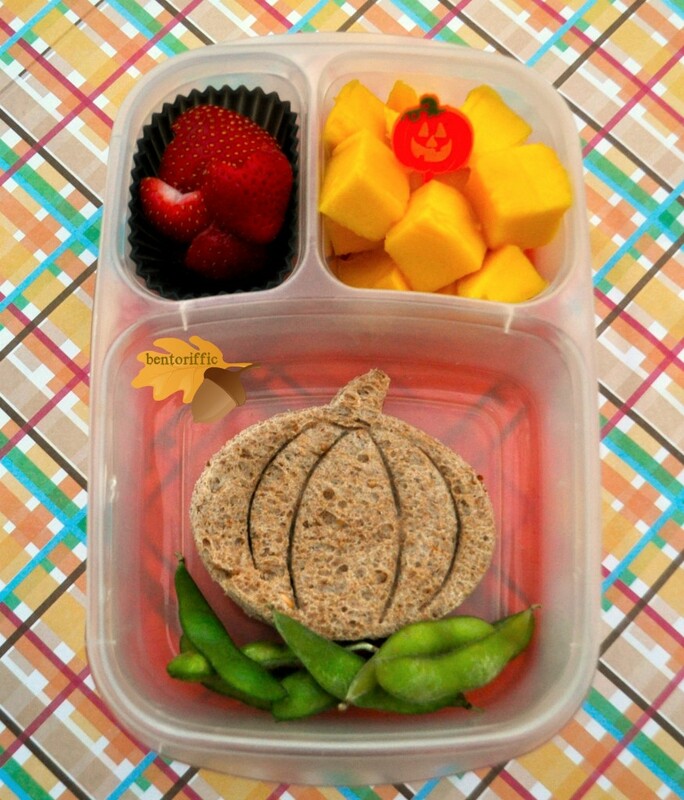 If you have a scrap large enough, cut out a small and simple pumpkin shape. 4. Put small container in the corner of your main dish and fill with Ranch dressing. Alternately you could use another of your child's favorite dipping sauces. Make sure this container can seal shut. The Easy Lunch Boxes mini-dipper works well so I used it here. 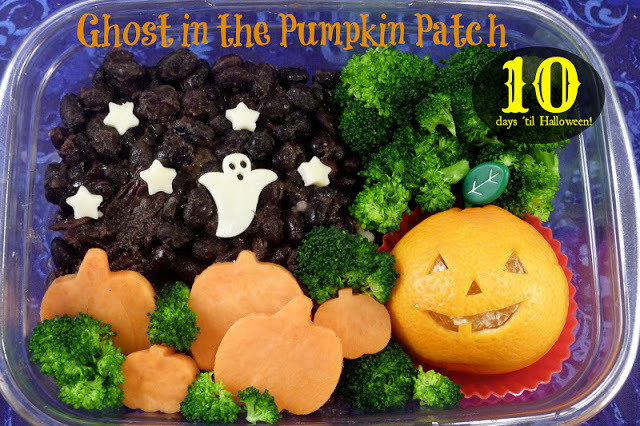 Place the small pumpkin you made earlier on top of the ranch dressing. 5. Trim the stem off of four mushrooms. Towards the top of each mushroom make a small "cross" cut with a knife. 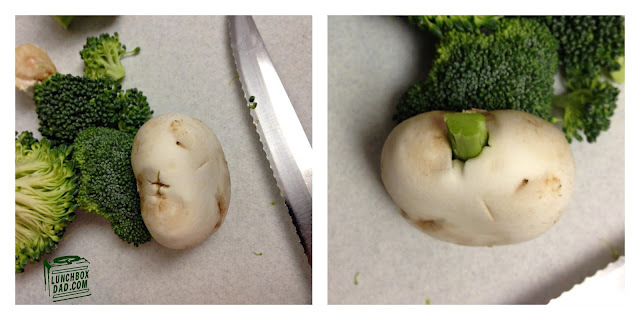 Now take a little piece of broccoli stem and press it into the cut in the mushroom as shown in the picture below. This creates your "white" pumpkins. 6. 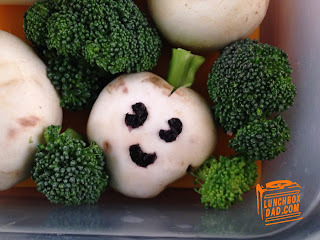 Place the white pumpkin mushroom in the main container. Surround these with small pieces of broccoli. 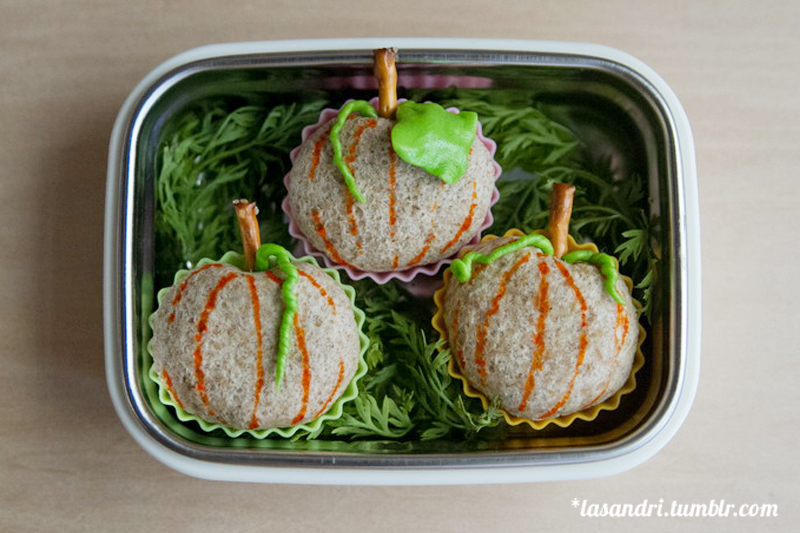 To make the Jack-O-Lantern faces on the pumpkins, cut out small pieces of nori for the eyes and mouth. You can also use a nori punch to make the shapes, it is much easier. Make sure to also put a face on the pumpkin shaped cheese you made earlier. 7. 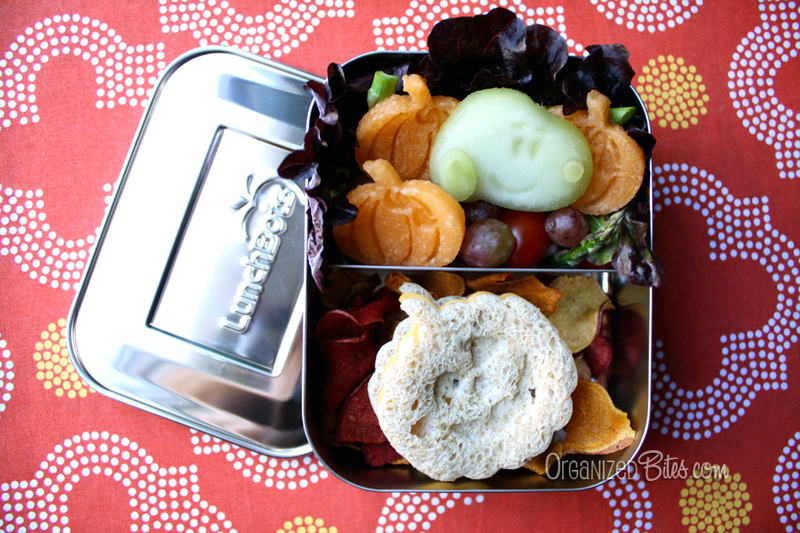 Top it all off with a Lunchbox Love note if you wish. They make great decorations! Thanks for being part of my little blog. I really appreciate each and every one of you readers. Remember that I post many more food and parenting related things on Facebook and Twitter as well, so check out Lunchbox Dad there! 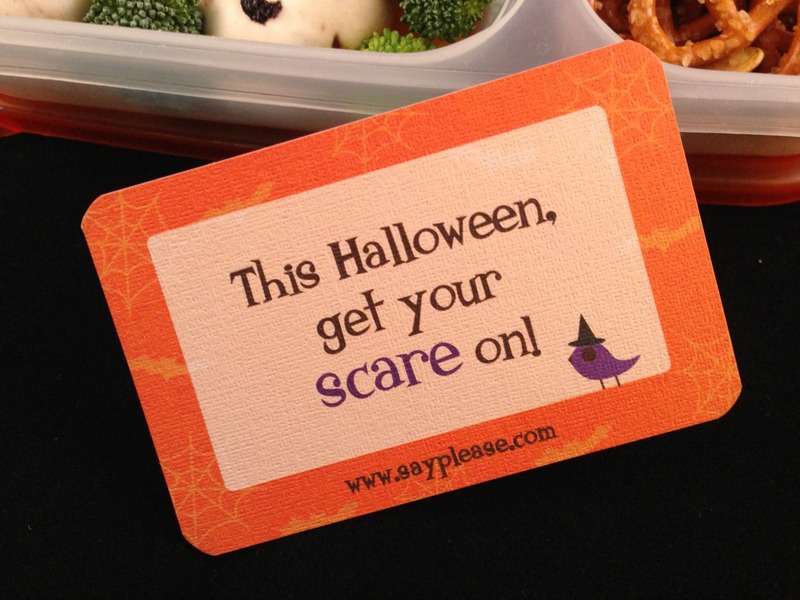 I hope you have a great week and a safe Halloween. Don't raid, I mean "test," too much of your kid's candy! No problem Michelle yours was an awesome lunch! Love it! Thank you for including mine! Thanks for making great lunches! Great lunch! 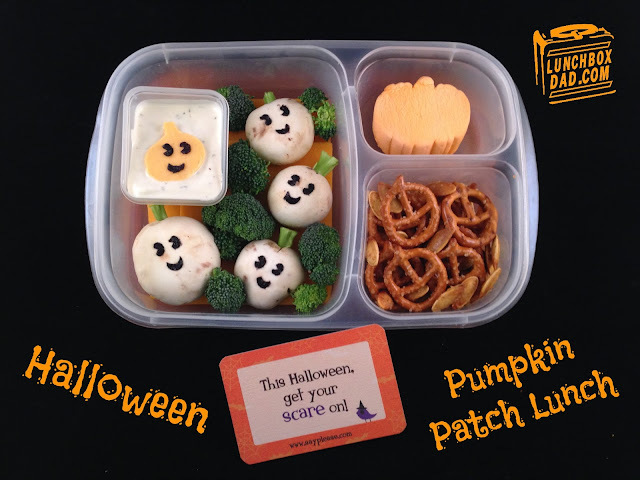 Thanks for sharing the list of other fun pumpkin patch lunches. This lunch is so great. You're awesome! I love those mushroom pumpkins! thanks for including me - I feel honored! 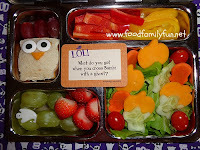 Thanks Kristie and thanks for letting me include your lunch!